A private rocket poised to launch its first official cargo delivery run to the International Space Station performed a major engine test this weekend, setting the stage for its planned Oct. 7 liftoff. The Falcon 9 rocket fired up its nine Merlin engines on Saturday (Sept. 29) for just two seconds during a full dress rehearsal at Florida's Cape Canaveral Air Force Station ahead of the upcoming flight by Space Exploration Technologies (SpaceX). "During the static fire test today, SpaceX engineers ran through all countdown processes as though it were launch day," SpaceX officials wrote in an update Saturday. 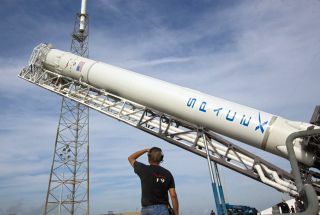 "Post static fire, SpaceX will conduct a thorough review of all data, and the Dragon spacecraft will be mated to Falcon 9 in preparation for next Sunday's targeted launch." The Falcon 9 rocket is scheduled to launch an unmanned Dragon space capsule (also built by SpaceX) on Sunday at 8:35 p.m. EDT (0035 Oct. 8 GMT). If all goes well, the spacecraft should arrive at the International Space Station on Oct. 10, where it will be grappled by a robotic arm controlled by astronauts and attached to a docking port. The Hawthorne, Calif.-based SpaceX is one of two U.S. spaceflight companies with contracts to provide robotic cargo flights to the International Space Station for NASA. The other firm, Orbital Sciences Corp., of Virginia, has a $1.9 billion contract for eight missions using its new Antares rocket and Cygnus spacecraft. The first Antares rocket rolled out to its launch pad on the Virginia coast today (Oct. 1). With the retirement of NASA's space shuttle fleet in 2011, the space agency is relying on new privately built spacecraft to ferry American astronauts and cargo to and from low-Earth orbit. The unmanned resupply flights are the first stage of that plan, which also includes purchasing seats for U.S. astronauts on private space taxis once they become available. SpaceX is one of several companies also seeking to launch astronauts into space for NASA. The company plans to use a crewed variant of its Dragon capsule for the job. The upcoming Falcon 9 launch will be the fourth flight of the booster for SpaceX and the third flight of a Dragon spacecraft. The Dragon capsule made its first test flight in December 2010, which was followed by a successful round trip to the International Space Station earlier this year during SpaceX's demonstration flight in May. For Sunday's launch, Dragon will be flying a mission for NASA's Commercial Resupply Services program. The flight is designated SpaceX CRS-1 and will deliver about 1,000 pounds (453 kilograms) of cargo, a shipment that includes supplies for 166 different experiments on the space station. SpaceX's Dragon spacecraft are designed to make ocean landings and be recovered, allowing NASA to return a substantial amount of science experiments or equipment back to Earth — something only NASA's space shuttles could do before. While the Dragon space capsules are the first robotic U.S. spacecraft to visit the International Space Station, unmanned cargo ships from other countries have made routine deliveries to the orbiting lab. Russia's robotic Progress spacecraft, Europe's Automated Transfer Vehicles and Japan's H-2 Transfer Vehicles round out the station's robotic resupply fleet. SpaceX was founded in 2002 by entrepreneur Elon Musk to develop commercial rockets and spacecraft. Musk has said his goal is to develop a reusable launch system, one which could one day help humans explore Mars.